I met a girl as part of the Uyuni tour who I went to La Paz with and as we were traveling in the same direction, we headed to Copacobana and Isla del Sol together as well. 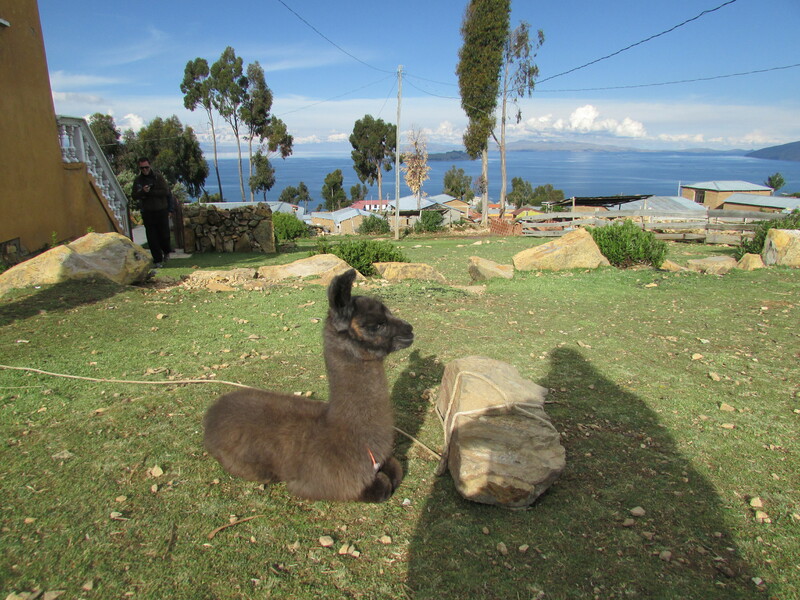 Copacobana, Bolivia is on Lake Titicaca in Bolivia. 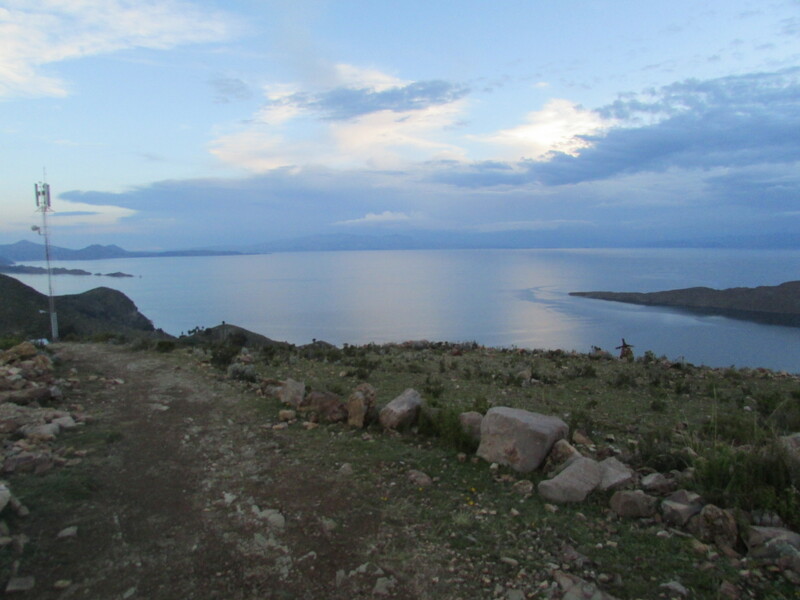 Lake Titicaca is the worlds highest (elevation) fresh water lake. We were told to stay on Isla del Sol so when we arrived in Copacobana at around 12 from La Paz (just a 4 hour ride), we booked a water taxi to the island. We also went ahead and booked accommodation as we didn’t want to run into a situation where we had no place to stay. This was one of those instances where it does NOT pay to plan ahead. 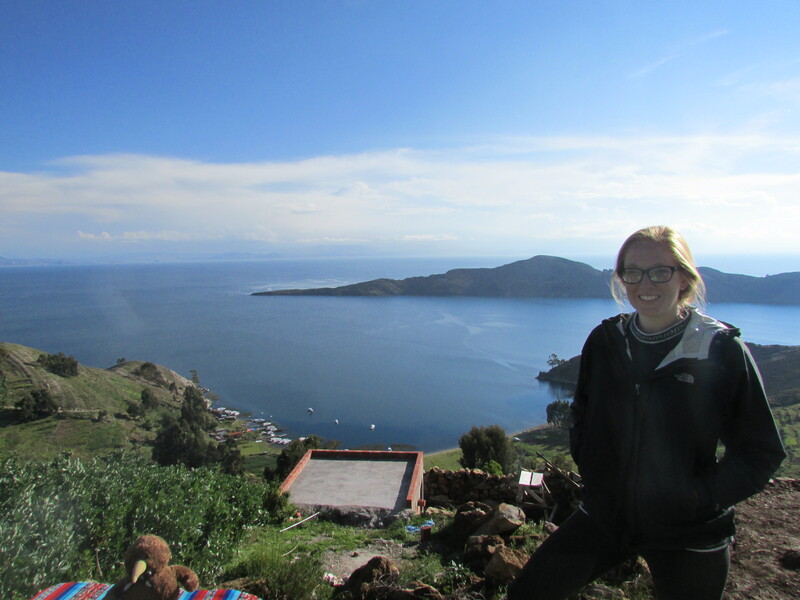 We arrived after about an hour and a half boat ride on the south end of Isla del Sol. The ride cost us 15 bolivianos or around 2 dollars. We met another traveler who was staying at the same place as us. As I was getting over being sick, I felt better than the day before but not 100%. The daunting hike you face as soon as you arrive at the island. There was a girl waiting for us at the docks to take us to the hotel. The view getting off of the boat is daunting. After just having been sick, being at elevation of over 3000 meters, I wanted to cry. Walking up just the entrance to Isla del Sol was incredibly difficult for me. I thought I might have a heart attack. We basically hiked up a mountain for 50 minutes with a 15 kilo bag and huge purse. It was so painful. I had to stop numerous times behind everyone. When we finally reached the top (after passing numerous hostels that I came to found out cost about a 1/3 of what we were paying), we still had to walk another good 15 minutes. View from the top. Was it worth it? I think so. I was more than ticked off and exhausted by the time we arrived. I cannot recommend Hotel del Sol. It is overpriced and difficult to get to. The views, of course are gorgeous, but they are gorgeous throughout the entire island. We dropped our bags and headed to the place down the street for a drink. We relaxed finally and I was glad I had made it to the top. The rest of the night was simple and consisted of taking more pictures, a hike up a smaller hill and then a dinner where everything I wanted to eat, seemed to be unavailable. At least we got some nice photos at the top. The next day was simple and at least our hotel included breakfast. There are only a few boats back to the mainland each day and as I was ready to catch the 1:30 bus, I opted for the 10 am boat. Due to the epic walk, you have to leave about an hour early. As we mentally prepared for the exhausting walk back to the pier, we had some guys stop us and ask if we wanted to be taken from the other side of the island. As we could actually see those boats, we opted for that and headed down. Isla del Sol is dreamy. It is a peaceful place with great views. It is not for those with asthma or who cannot hike up a hill. It would be very difficult for an unfit person to stay on Isla del Sol or really get to enjoy all it has to offer. However, if you are up for a bit of work to reach your destination, the island may be a perfect option for you.